Digital publishing guru Deke McClelland has written over 80 books on computer design and imaging that have won numerous industry awards. An Adobe Certified Expert, Deke is a featured speaker at The InDesign Conference and a member of the PhotoshopWorld Instructor Dream Team. Deke hosts the exhaustive and entertaining DVDs Total Training for Adobe Photoshop and QuarkXPress to Adobe InDesign CS-Making the Switch. In 2002, Deke was inducted into the National Association of Photoshop Professionals' Photoshop Hall of Fame. Nothing speeds up learning like personal training from a skilled tutor. 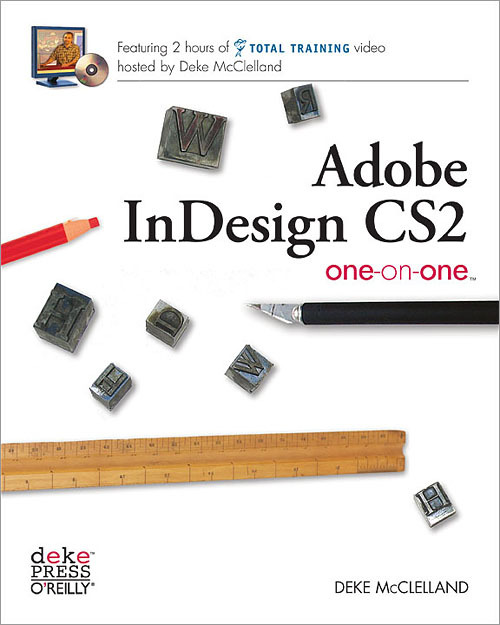 Adobe InDesign CS2 One-on-One delivers that invaluable learning experience by giving you the closest thing possible to private lessons with author Deke McClelland, a world-renowned expert on digital graphics and design. You can proceed at your own pace, working on relevant, real-world projects, while mastering fundamental and advanced concepts, theories, techniques, and best practices for making the most of InDesign. With over two hours of Deke's professional instruction and advice, and 600 full-color images, diagrams, and screenshots to illustrate every key step, you'll soon be on the fast track to becoming a real InDesign expert. When you're finished with Adobe InDesign CS2 One-on-One, you'll use InDesign smarter, faster, more creatively, and more efficiently than you ever thought possible.